An attempted mass shooting ended with no innocent bystanders injured all thanks to a law-abiding Uber driver with a gun, in Chicago of all places! An armed man began shooting into a crowd of people at Logan Square in Chicago late Friday night. After witnessing everything from his vehicle, an Uber driver with a concealed carry permit immediately responded to what could have been a horrible incident by pulling his own weapon and firing six shots at the gunman. The gunman was later identified as 22-year-old Everardo Custodio, who is currently being treated for gunshot wounds to the thigh, shin, and lower back at Advocate Illinois Masonic hospital. According to the Chicago Tribune, the Uber driver was in a parked car nearby when he witnessed Custodio shooting into a crowd of pedestrians at the 2900 block of North Milwaukee Avenue. The driver, who has only been identified as a 47-year-old male from Little Italy, fired six shots at the gunman and remained at the scene until police arrived. He immediately presented his valid concealed carry permit and firearms owner’s identification card. Join the National Rifle Association this weekend for the 144th annual NRA Meeting & Exhibits at the Music City Center in Nashville, Tennessee. Pack your guns and your NRA membership card because this weekend will be full of concerts, gun shows, competitions, family activities, speeches, and more. Friday, April 10 through Sunday, April 12, the Music City Center in Nashville, Tennessee will be housing over 550 exhibitors during the 144th annual NRA Meeting and Exhibits. With an expected turnout of over 70,000 attendees, this event is not only one of the largest shooting and outdoor shows in the country, but will also be the largest convention ever to be held in Nashville. Want to know which Republican presidential hopefuls will be speaking at the event? Click here to read the full article. A Georgia gun owner is labeled a hero after stopping a car thief and saving the life of the woman clinging to the hood. A Georgia concealed carry permit holder put a stop to an attempted carjacking at the Fast Track Car Wash in Smyrna on Friday afternoon. While the victim was vacuuming her vehicle, a teenage male came out of a red van parked next to her and attempted to drive away with her car. 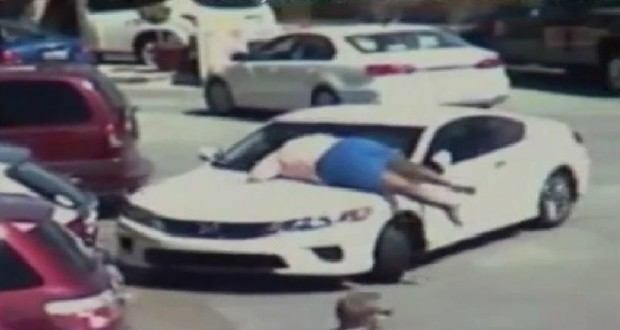 The suspect began to speed up after the owner of the white Honda jumped onto the hood with the intent of stopping him from driving away. A Smyrna, Georgia city worker was passing by and drew his gun. View the surveillance video and the full post here.